Everybody get your claws out, ’cause it’s time for another rendition of NAILZ WEEK! If you missed last year’s party, Nailz Week is where us lovers of fancy talons can celebrate all things Nail Art! I’ll have interviews with badass nail artists, talk about my fave movies, and end it with a fun giveaway! 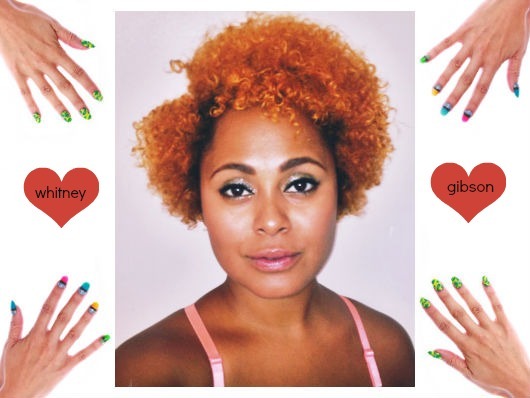 Today I’m kicking off the shenanigans by talking to Whitney Gibson of Pushy Nails. I’ve had the pleasure of getting my nails done by Whitney and it’s always a good time where we gossip about our fave hunks (Andre 3000 and Ryan Gos,) and listen to the sweet sounds of St. Mariah. Can you tell me a bit about your background and how you got started doing nails? I started doing my own nails as a hobby. I’m an artist- I draw, paint, take photos, sculpt, you name it- so I took to it quickly. My friends started asking me to do their nails and since many of them work in film or fashion, that eventually lead to me doing nails for the projects they were working on. Initially, I didn’t see myself doing nails for work because I didn’t want to be stuck in a salon all day, but once I realized I could work on set, everything changed for me. What’s your favorite nail trend? Any you hate? My favorite trend right now is probably what I would call adult nail art. I’ve been using a lot of sheer polish and negative space to get that ‘nails did’ feeling without compromising the chic-ness. That’s not to say that I don’t like bright, funky colors– I do! I just like the idea of having nails that you love that you can wear to work, too. In terms of what I don’t like, I like it all! I love that people get crazy and express themselves! The only thing that skeeves me out is duck tips– acrylic nails that flare out like duck feet. I just don’t get it. 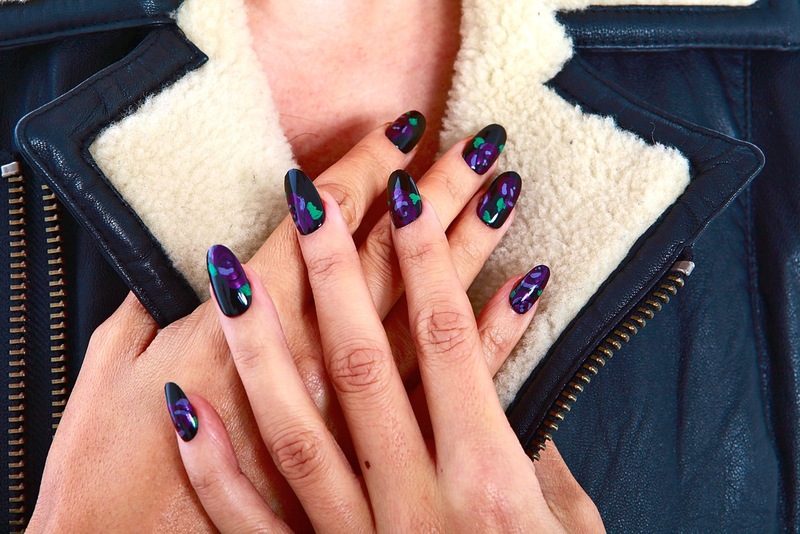 Nails by Whitney Gibson for Sephora Formula X. What are some of your favorite polishes right now? In life and nails, I love a high brow/low brow blend. I love the new Marc Jacobs polish, but I get down with some dollar store polish too. I’m always on the prowl for colors I don’t have. Floss Gloss’ new color, Gangsta Boo is the perrrrfect red. And Sephora’s new Formula X is amazing! They have something like 200 colors, so many different kinds of glitters, and their cremes are sooo creamy. Whose nails are you dying to do? My dream client is Ryan Gosling. I give a great file and buff and I’d show him the care and consideration he deserves. 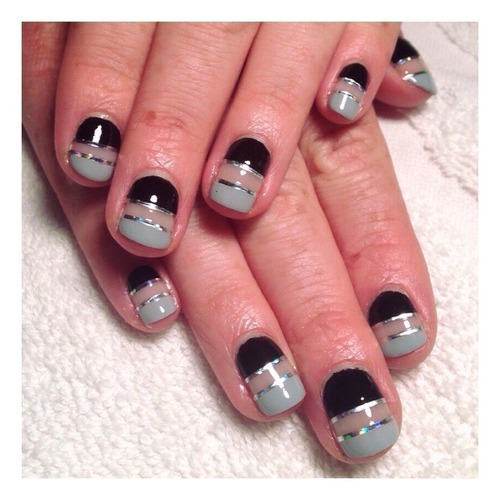 Jokes aside, I’d loovvvve to do Tavi Gevinson’s nails. I’ve been following her career forever and I think she’s such a hero for girls. And Bad Gal Riri because duh. And of course, Gwen Stefani is like every girl’s ultimate dream client because she’s been into nail art since before nail art was hot. Camo nails by Whitney Gibson for Sephora Formula X. 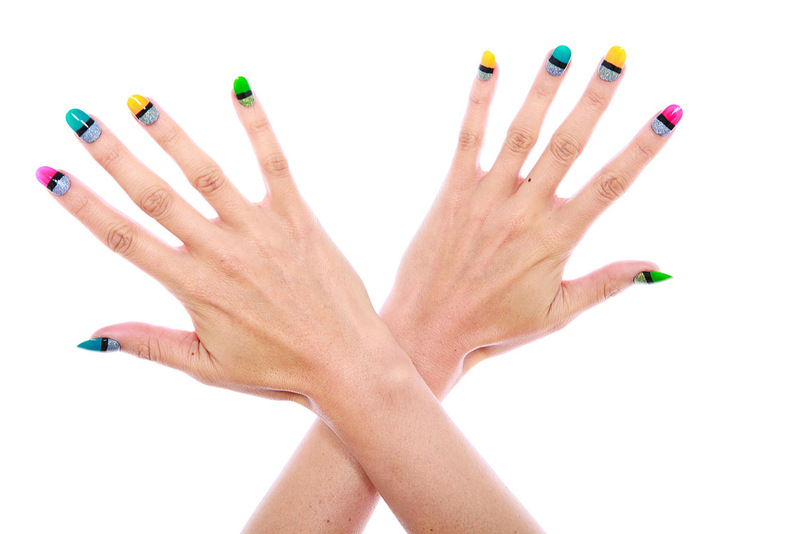 What would you put on a Manicure Mixtape of your Favorite songs? I like to listen to hip hop when I do nails. It makes me feel like I’m at a barber shop in the hood. I mix in some down tempo R&B to keep things from getting too hyphy. My style icons are all over the place. I’m OBSESSED with Janet Jackson circa Poetic Justice. The braids, the baggy jeans and boots, the crop tops. Swoon. Basically any R&B singer from the 90’s is good for me, stylistically. They were so good at mixing masculine street wear/sportswear with feminine curves, long nails and bold lips. Inversely, I love the clean lines and androgynous silhouettes of Scandinavian women. Lykke Li, for example, is a fashion killah. Oh, and I’d be remiss if I didn’t mention Solange. She’s my queen. The aforementioned RG forever and ever, no matter how cliche. Sam Rockwell drives me crazy because he’s so weird. And I love a redhead so Archy Marshall (King Krule) could get it, too. Plus his music is the bomb. What’s Frank Ocean’s ex boo thang’s name? Willy Cartier? He foine. Oh and there’s this LA-based model who is the most physically attractive man I’ve ever seen. His name is Victor Ross and you are welcome in advance. 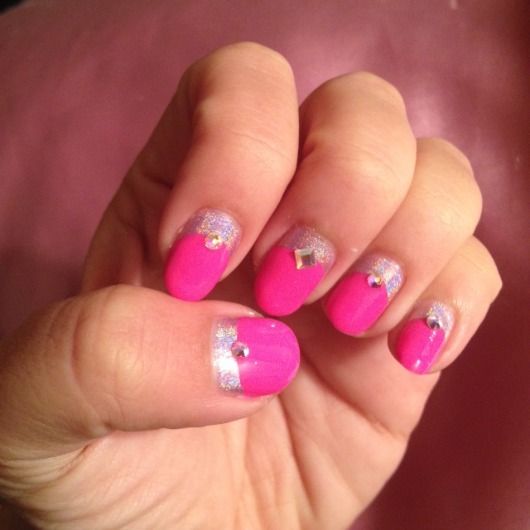 My most recent manicure with Whitney: Hologram Barbie nails! 1. I’ve been binge watching Key and Peele. Jordan Peele is the funniest human. Also, that show has a tight wig game. 2. Sports bras. I own probably 40. 3. See-thru clothes. I’m making myself the most amazing sheer wardrobe with the help of my wonderful mom. 4. I’m obsessed with this side project I’m working on with my friend, crazy talented producer Jon Mills. I’m a little shy, so I won’t say too much, but let’s just say I’m a nail artist/rapper/full time freak. 5. Food. LA has an amazing food scene. I’ve been craving the chicken sandwich from Son of a Gun for days, but I live on the eastside so I get my fix at Canale, which has an equally impressive fried chicken masterpiece. Any new projects you can share with us? Upcoming nail projects– I’m working on some nail-related jewelry and maybe some tees, trying to get some tutorials up on the webz, and generally just trying to make art with rad people!